Honolulu, HI, September 05, 2017 –(PR.com)– For many years, Co-Founder of Adoboloco, Tim Parsons has been making Hawaiian Barbecue for family and friends. Requests started coming in “You need to bottle this! It needs to be part of Adoboloco so we can have it at home.” Some couldn’t eat it due to the original ingredients. Inspired by a family member that suffers from Celiac Disease, it was time to make some changes. Everyone should be able to enjoy it. Adoboloco has spent the last year reformulating the original recipe to be healthier. It's now Non-GMO, MSG Free, Gluten Free and no corn syrup. PAU! HANA! HAWAIIAN BBQ! gives you the authentic Hawaiian Barbecue flavor. Its ready to serve and easy to use in almost any dish. A melting pot of ethnic backgrounds has brought many delicious foods to Hawaii. The fusion of cultures and flavors has inspired many. This and the fact that Hawaii is so remote, fosters the creative, unique cuisine. Remember the last time you were on the beach in Hawaii? Or a pau hana (after work) BBQ in the driveway or backyard with family, friends and neighbors. Now it's possible to have these flavors all year round with PAU! HANA! HAWAIIAN BBQ! The smell of the grill, hot and loaded with ono (delicious) food. Or cooking an easy mid-week dinner for the family. 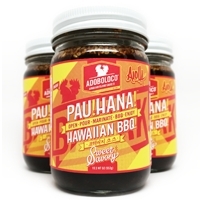 About Adoboloco Hawaiian Island Sauce Co.
Adoboloco has embodied the old style Hawaiian “chili pepper water” and revolutionized it into a modern day, fusion hot sauce. Adoboloco only uses 4-5 ingredients. Simple is best! Our sauces are 100% natural. Perfect if you're looking for an alternative to the mass market hot sauces and dressings. Adoboloco hot sauces range from mild to very hot, but never compromise on flavor. Gluten Free, NON-GMO PAU! HANA! HAWAIIAN BBQ! Is the newest addition. Adoboloco sprouted from a homeschool garden project in Maui Hawaii in 2011. Now the business involves the whole Parsons family. It's teaching our children community, farm and business skills. Adoboloco manufactures both in Hawaii (For Hawaii Distribution) and Oregon (For Mainland Distribution). All five flavors of Adoboloco hot sauce are available for wholesale distribution.